This city may be known for fish tacos, but there are plenty of steak aficionados—and talented chefs—who wholeheartedly embrace sizzling slabs. Like your steakhouses old fashioned and buttoned-down? Check. Prefer hip, new-school establishments that take pride in their craft cocktails? Also check. Whatever vibe you’re going for, San Diego steakhouses will serve it up, right beside hefty cuts of supremely high quality steak, however you like it. Hip cowpokes will want to dismount from their steeds and step right into the award-winning Western-meets-modern environs of this decade-old steakhouse. The humanely-raised nature of the beef is not only good for the conscience, but manifests in exquisite dry-aged ribeye, Wagyu skirt steak, T-bone, filet mignon, and every other cut carnivores crave. The seafood meets the Monterey Bay Aquarium’s Seafood Watch standard, so you can feel just as well ordering chardonnay steamed mussels or salmon almondine. It’s not easy to make a splash in Little Italy—San Diego’s trendiest restaurant district. But for good reason, Born and Raised did just that when it opened in 2017, fusing Great Gatsby-style luxury with flare like portraits of hip-hop legends hung on the walls. Get ready for bartenders in white tuxedo jackets, added touches like tableside carts for freshly-shaken Rob Roys, and of course high-end slabs of beef. This two-story steakhouse occupies a building that in its nearly 150-year history was home to City Hall, the police department, library, and a string of theaters. The steakhouse sizzled to life in 1999, establishing a reputation as one of the finest place to get Wagyu beef in California. Choose cuts from the U.S., Australia, or Japan, each of which produce unique, well-marbled steaks. This well-regarded small chain one-ups its downtown location with this spot whose view overlooking the ever-picturesque La Jolla Cove should be considered USDA Prime, like its steaks. A newly-renovated patio seats 48 red meat-lovers, though those not looking for peppercorn filet mignon, t-bone, or ribeye, can avail themselves of steaks of the sesame-crusted ahi tuna variety, plus Alaskan king crab, pan-seared halibut, and the like. 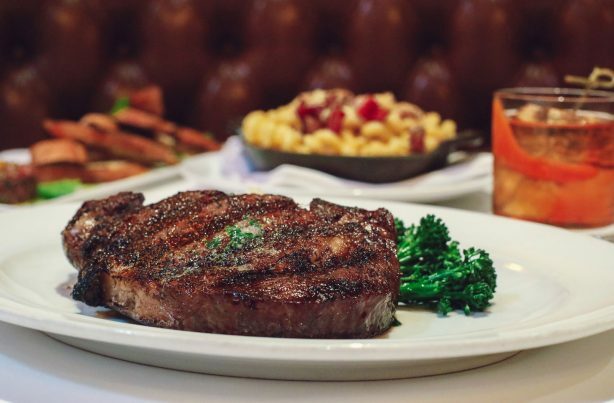 Here’s two reasons to dine at Del Frisco’s at the new Intercontinental Hotel – indulging in hand-cut steaks, and enjoying a spectacular sunset over the San Diego bay. Located at historic Lane Field, along the Embarcadero, the elevated experience is accented by its sleek architecture, modern décor, and exemplary service. This entry was posted in Dining by San Diego Magazine. Bookmark the permalink.